Since their infamous appearance on the TV Talent Show the X Factor and Benidorm Unpacked, Matthew and Son have become the act everyone is going to see. The night I saw the show, the room although starting off reasonably quiet gradually filled up and was and was full within a few minutes. Matthew and Son have been entertaining over here for six years and before that were resident in Majorca. Although they call themselves Matthew and Son it is Matthew who is the son of Colin and they have been performing together for about 18 years. Colin has been in the entertainment business and served his apprenticeship in all the clubs throughout the UK for many years and as such has worked with many famous names including Bob Monkhouse, Tommy Cooper and Matt Munroe to name but a few. He was once a Butlin’s Red Coat and entertainments manager for Pontins and has made appearances on Barrymore and That’s Life TV programmes. At the age of 11 Matthew appeared live on TV in Poland singing on New Year’s Eve. It was clear to see that during their performances they have a staunch following because many of the people in the audience were known by Matthew and Son as they turn up to see them time and time again. 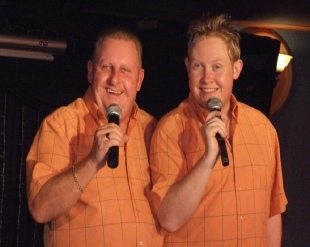 The act incorporates singing interspersed with their style of humour which takes on the role of a double act. The crowd seemed to love it and joined in with them. Take a stroll down to Valentines and see Mathew and Son you’ll be surprised how many people go to see them since their TV appearances. For espana-resort.com this week I went along to Valentines Night Spot just in the alleyway between the Av Mediterraneo and Calle Gerona opposite the Riudor Hotel to see an act which almost becoming a tourist attraction among the nightlife here on the Costa Blanca.